The picks and round one standings for this week's tournament are on the site. We chose 25 golfers. Rory is the favorite, chosen by all but one of us. Rickie is runner-up again, picked by 12 players. Adam and Sergio show up on 10 teams each. Loopy Jim got the nod 9 times. Phil, Jason and Henrik are each on 6 teams. Five of us like Sneeedeker. Rose and Walker are 4-baggers. Jay's boy, Bill, is the lone trey. Keegan, Gray-me and young Jordan are the deuces for the week. We came up with 10 uniques. Shelley and Mike M. lead with 2 each. Brett, Dan, Bill, Chris and both Daves have one each. The other 7 of us towed the line and couldn't pull out a playoff unique. Randy and Mike D. have the same 7 golfers. As a rule I don't put pictures in these emails, but we have a worthy exception this week. Dave A. and Elise Q. had their first child a week ago Tuesday, Emerson Arthur. You will see his picture at the end of this email. 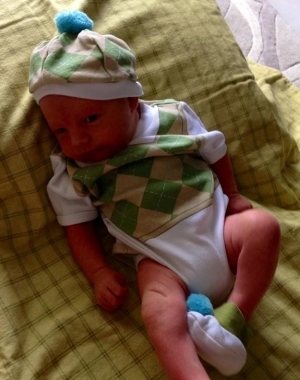 I guess he's wearing his first golfing outfit, I know Dave has a hat just like that. I'm sure Dave is already working on his grip. Emerson was good enough to come on a pool off-week. Since he is the first child born to 2 members of this Pool (one current and one former), I am making Emerson the first Junior Rule 20-6 Golf Pool member. Once he's able to point at the computer screen I'm sure Dave will be teaching him his tricks on winning majors. Congratulations to both Elise and Dave.